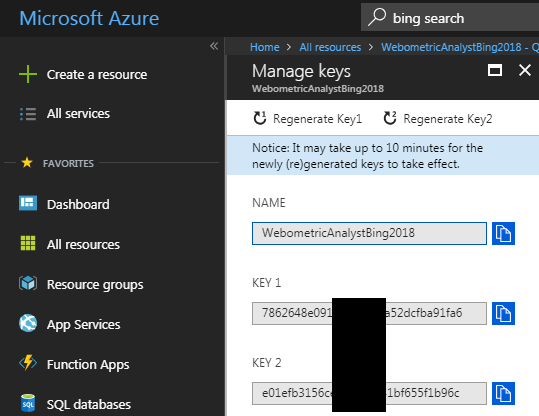 Please follow the instructions below for a key to use 1000 free automatic Bing queries in Webometric Analyst within 30 days, or to pay Microsoft to use more queries (see the end). Your screen may be a bit different from this, and Microsoft might give you different options. 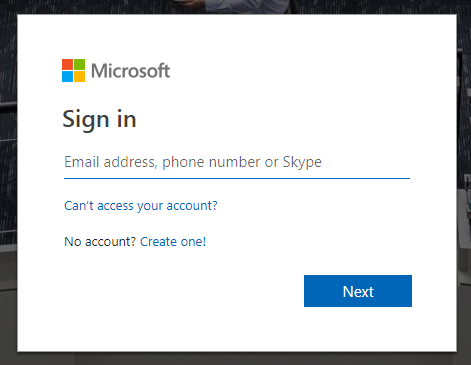 Step 1: Log in to a Microsoft account (e.g., Hotmail, live.com, Microsoft.com). If you don't have one, please create one (free). Step 2: Control-click to open the Bing web search API start page in a new browser tab. 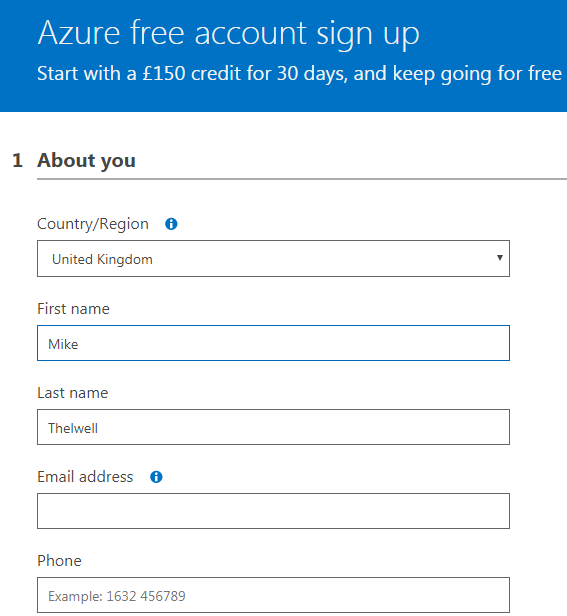 Step 4: You will need to create an Azure account with Microsoft first. Click Start free. Step 5: Sign in to your Microsoft email account, if requested. Step 6: Enter your personal details, if requested. 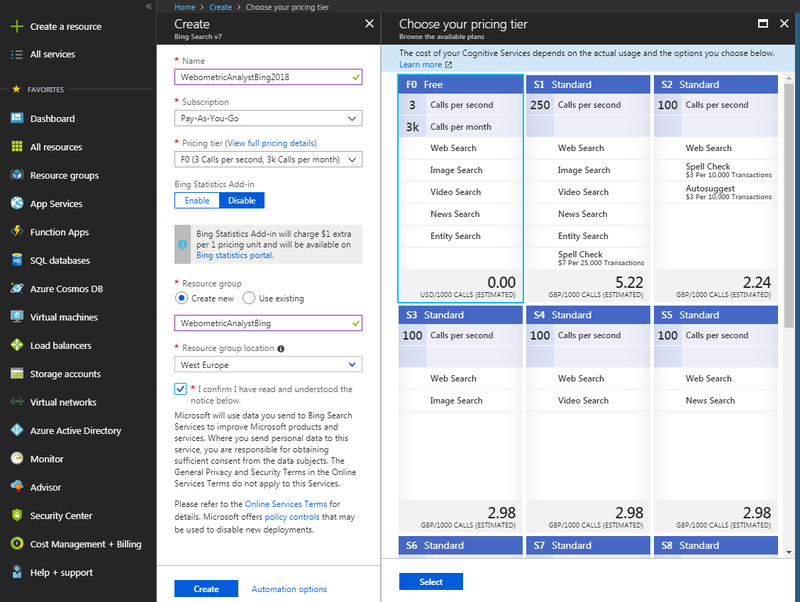 Step 7: When taken to the Dashboard, enter Bing Search in the top middle query box, press return and select Bing Search v7 from the list that appears. Step 8: Select the F0 Free tier (3 queries per second is plenty), make sure the Statistics is Disabled, enter any names you like and click Create. Please be careful with this step. Anything other than F0 will cost you money even if you do not use the service. You may see different options, but please read them carefully. Step 9: Click All resources in the left menu bar and then click your service next to a blue cloud. Step 10: Click the Keys blue underlined link. Step 11: Copy your 24 character key1 or key 2 , which should be near the bottom of the page (see below). Save it in a safe place, such as by emailing it to yourself. Entering this into Webometric Analyst will get you free searches. Step 12: To use the queries, start Webometric Analyst, select Link Analysis Wizard from the File menu and enter the key in the Bing section. The terms and conditions should tell you how long you can use the key for. Step 13: Close the browser or tab – you won’t need it again unless you decide to buy a paid subscription.